The North Indian state of Uttarakhand is now the eighth state in the country to pass legislation that is officially named the “Freedom of Religion Act” but has the allegedly hidden intent to punish those who facilitate religious conversions, especially conversions from Hinduism to Christianity. The latest law carries a jail term of up to two years. The Governor of Uttarakhand, Krishna Kant Paul, signed the Uttarakhand Freedom of Religion Bill of 2018 into law this month, according to local media reports. The law will be in force as soon as the state government, governed by the Hindu nationalist Bharatiya Janata Party, drafts its rules. The bill was passed in the state assembly last month. On paper, the legislation claims to ban conversion by the use of force, fraud or inducement, but these terms are defined loosely to include social work, praying for the sick or even evangelism. It is commonly referred to as an “anti-conversion” law. The eastern state of Odisha, the central states of Madhya Pradesh and Chattisgarh, the northern state of Himachal Pradesh and the western state of Gujarat also have similar laws in force. The northern state of Rajasthan, too, has an anti-conversion law on paper, but the bill is pending with the president of India. In the northeastern state of Arunachal Pradesh, it is awaiting implementation. Last year, the eastern state of Jharkhand introduced the “Religious Freedom Bill,” requiring converts to inform state officials of the time, place and the name of the person administering the conversion. Those found guilty face fines of up to $1,500 (100,000 rupees) and four years in prison. It is yet to be passed in the state legislature. This week, the U.S. Commission on International Religious Freedom recommended that the U.S. government call on the Indian government to repeal anti-conversion laws. The commission noted that nearly one-third of India’s states were enforcing anti-conversion and/or anti-cow slaughter laws against “non-Hindus.” Cows are considered holy by sections of the majority Hindu community. 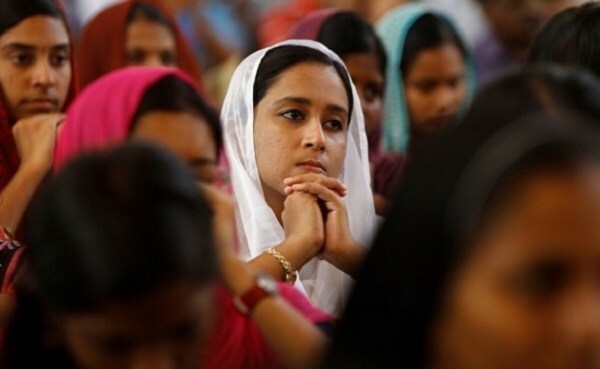 While hardly any Christian worker has been convicted by a court under the law, members of the minority community are routinely accused of and charged with “forcible” conversions of Hindus. Christians and rights groups say the law is used as a tool by right-wing Hindu groups to harass and persecute Christians and to restrict Hindus from converting away from their religion. Current religious tensions make the enactment of the law highly suspect for the minorities, including Christians and Muslims. Christian persecution, which includes violent attacks, destruction of Christian property and false accusations, has risen since the BJP won the general election in 2014. A report by an evangelical group in India described the year 2017 as “one of the most traumatic for the Christian community” in 10 years. Last year was the worst since 2007 and 2008, when about 100 Christians were killed and thousands of homes of Christians were burned down or destroyed in Orissa state’s Kandhamal district, said the Annual Report on Hate Crimes against Christians in India in 2017, released by the Religious Liberty Commission of the Evangelical Fellowship of India.